Township 6 North, Range 2 West, Section 24, Weber County. 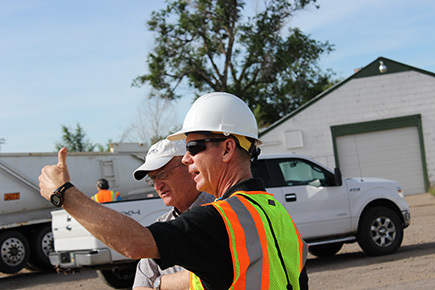 The site is located approximately 800 feet south, south east of the Advanced Paving office at 1723 West 1350 South. Non hazardous construction/demolition waste, as defined in UAC R315-301-2(17); yard waste, as defined in UAC R315-301-2(85); inert waste, as defined in UAC R315-301-2(37); waste tires, when the requirements of UAC R315-320 are met, and petroleum contaminated soils as allowed in UAC R315-315-8(3). All waste must be generated as part of the business operation of Advanced Paving and Construction. Hazardous waste as defined by UAC R315 1 and R315 2; no PCB’s as defined by UAC R315-301-2(53), except construction/demolition waste containing PCB’s as specified by UAC R315-315-7(2)(a) and (c); no household waste, except waste resulting from the abatement, rehabilitation, renovation and remodeling of homes and other residences; no municipal waste; no special waste, except as specified in this permit; no commercial waste; no dead animals, and no industrial waste.